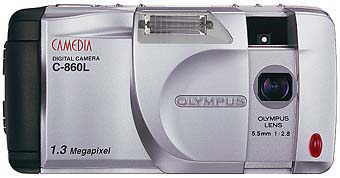 The Olympus C-860L is the follow-up model of the Olympus C-830L. Unlike the latter, the Olympus C-860L is equipped with a number of new features: adjustable Чувствительнось (ISO 120, 250 and 500), 64 MByte SmartMedia compatibility, a newly designed user interface, slow synchronisation when using flash, DPOF support, extended exposure compensation, white-balance presets, recordable camera settings, quick-view feature, digital zoom and storage in DCF Комплект. One restriction concerns the LCD display; instead of the original 72,000 pixels it may now only reproduce 61,000 pixels.